I’ve been keeping a full, vibrant, productive garden in my head for about two years. In my mind there are rows of beets, shoots of garlic, bushes of raspberries, clusters of strawberries, and vines of beans. Every plant flourishes year-round and is never plagued by weeds, bad soil, the first freeze (or any of the ones that follow), and definitely never suffers like I do from the hot, hot August Texas sun. Nonetheless, the food would probably taste better if it were real. While titles that start with phrases like “The Girl’s Guide to...” make me move forward with trepidation, chary of each frilly, gender-specific tip that is sure to be found inside, The Girl’s Guide to Growing Your Own seemed safe. I mean, it’s about gardening. Alex Mitchell, the saucy British journalist-turned-gardener who wrote the book, does an excellent job of presenting practical information and keeping the girly kitsch to a very tolerable level. I even giggled periodically. Really, giggled. Squashing the usual excuses for not getting a garden started, Mitchell starts her book off telling the reader how simple growing really is. She describes soil types in easy to understand detail and outlines just how little equipment (and space) you actually need to get going. One of my favorite suggestions was to use the wine shipping crates that are often discarded by liquor stores. They’re a good size, portable (if you want to bring plants in for the winter), and deep enough for most roots. Mitchell also points out that their “imprinted logos give them a certain élan.” And if you can pick up your planters with your booze, you might just save yourself a trip to a garden center. 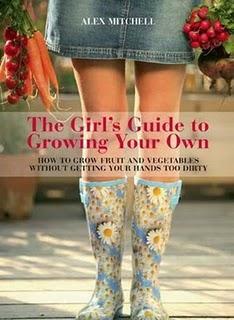 The Girl’s Guide to Growing Your Own stands apart from other growing manuals for a number of reasons. First, it’s readable. This book is not for a seasoned grower who is trying to find out why her lemon trees are looking peeked or those who can pour through dry textbook pages full of words most of us don’t understand. The Girl’s Guide to Growing Your Own caters to the novice, and does it well. Because it’s divided by seasons, you can use a free ten minutes to browse your seasonally-appropriate section and get ready to grow. The book introduces new gardeners to valuable gardening lingo, where to buy manure, and—here’s the kitsch—a plethora of cute growing containers available to the growing girl. Freely poking fun at her own obsessive nature—from the aesthetics of her planters to the trees she dotes on and the many short breaks she takes from work to ogle flora and fauna online—Mitchell takes the bulk of the work out of getting started. She even gives plants ratings of one to four hand trowels, which indicates whether “you couldn’t kill it if you tried” or it’s “fussy but fabulous.” Pages of soil and seed concoctions are broken up with recipes for your new produce (including alcoholic beverages), and the book finishes up with a quick guide to diagnosing common edible garden enemies. From this experience I have learned girly books can be useful, and also that because spring is (nearly) in the air, I should start planting my tomato seeds. Now I am hopeful.